Like muffins falling out off a billboard and crushing a car, large red balls are popping up - on crushed cars - to promote Powerball. Flicker user Andy explains, "I took it in the Twin Cities. 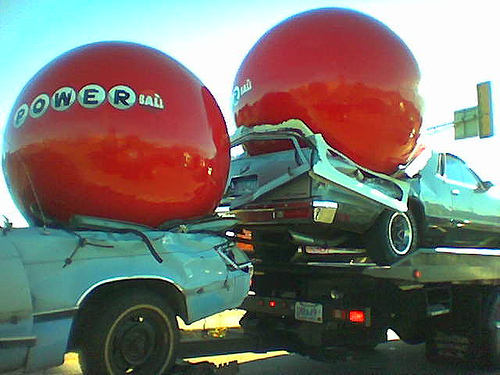 These two cars (and Powerballs) were on the back of a flatbed truck, being driven somewhere, possibly the MN State Fair, that was going on at the time." Yes, this happened back in September so don't get all pissy on us complaining the story isn't two seconds old.